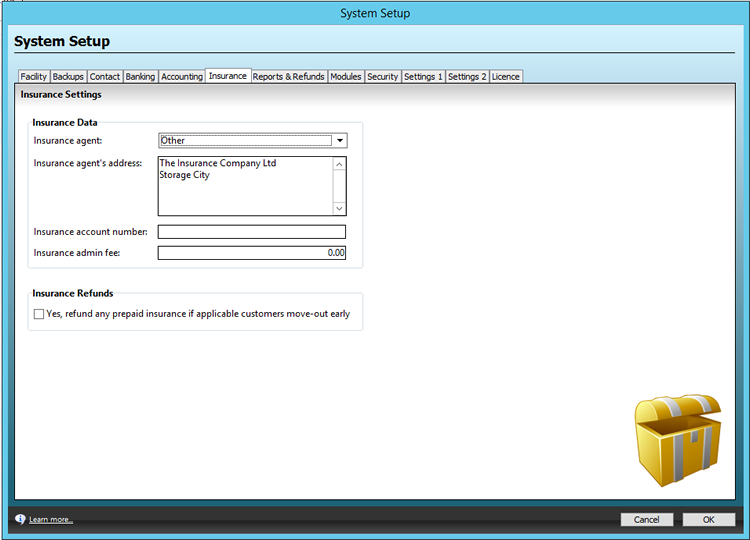 This article explains what each field is and does under the Insurance tab in system setup. Insurance data is used to set your insurance agent's information and account details (nb. this is the account information of YOUR company's account with this agent - not your Customers). If your business is located in the United States of America and you use MiniCo insurance, please select MiniCo from the dropdown as their insurance forms are built into Storman and can easily be pre filled & printed. You can also set the value of the Administration fee. Note: The only place this fee is currently used is on the MiniCo Insurance Reports, where a portion of the fee that the Customer is charged is retained by your company. MiniCo will negotiate how much your company can keep. The MiniCo module is currently only available to Customers located in the USA. The Insurance Refunds section is used to set whether any prepaid insurance can be refunded, should Customers move-out early.